Out working today and I had to get between two places that don't connect very well, so I got to see some new back roads! Discovered a small lake I'd never seen before, or even heard of, Pebawma Lake. 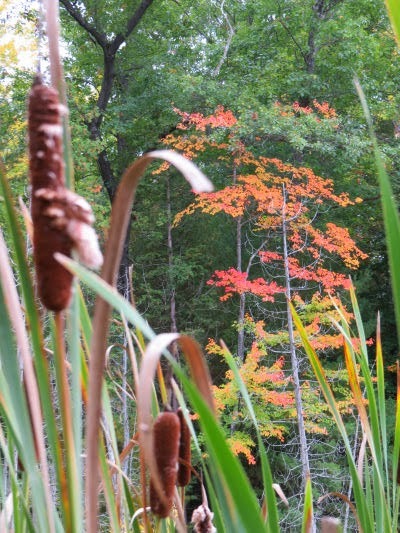 A little creek drains out of it that joins Beaver Creek, and wanders across three counties before circling back to eventually empty into the Pere Marquette River. 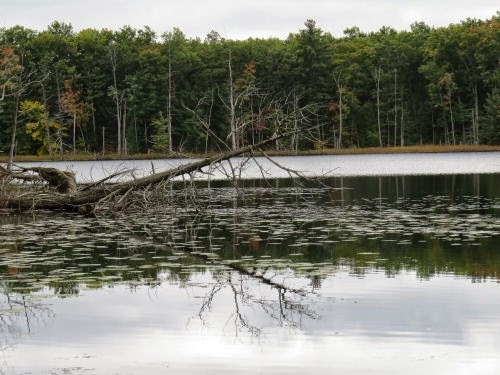 I thought I was going to show you back roads, but this lake was too charming. Here are the best pictures. Just enjoy. The place sure made my day! 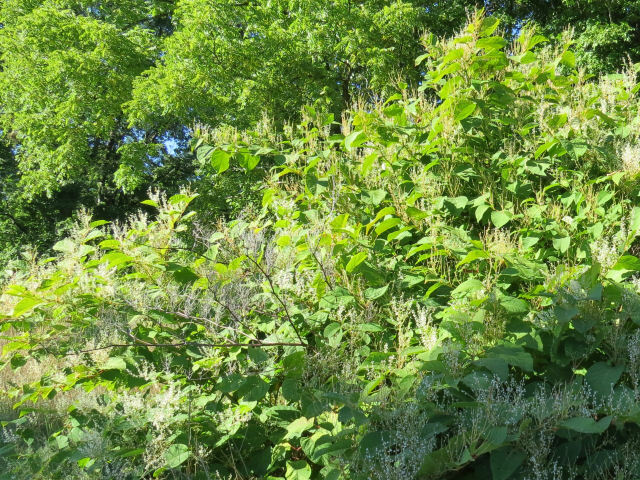 Today I bring you what is considered by some people to be the most invasive plant in the world. 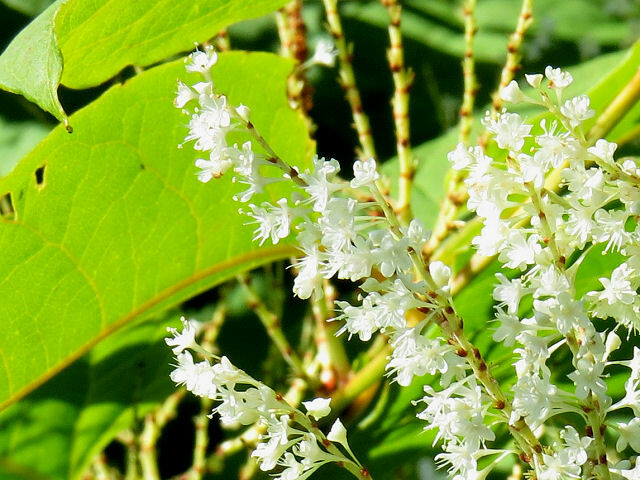 It's the beautiful and deadly (to other plants) Japanese knotweed, Fallopia japonica. I call it the "Kudzu of the North," because it has the capacity to choke out and kill all other plants, the way the kudzu vine has done so in parts of the South. 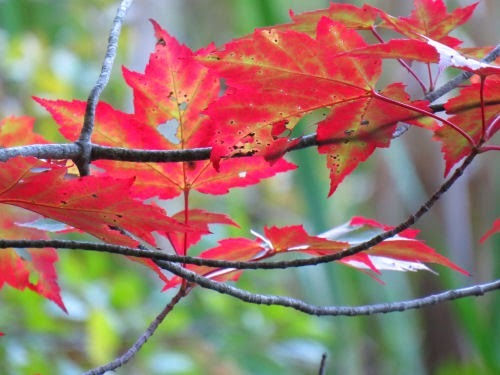 You've probably seen great banks of these shrubs growing beside the road or along streams. 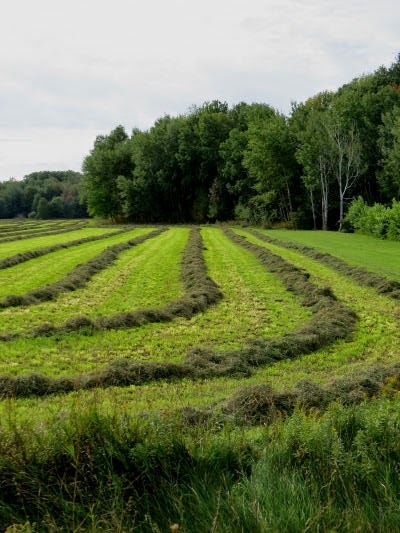 Some places are finally making a serious effort to control it. Of course, it's really pretty with dainty white blossoms. The flowers must be sweet. 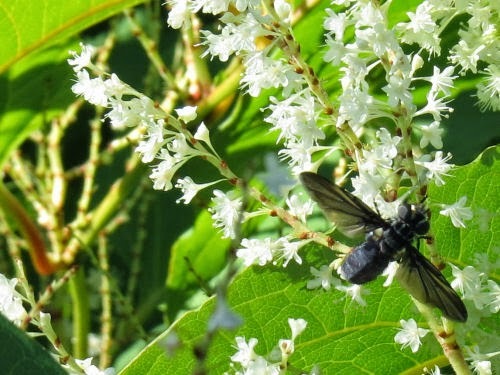 There were hundreds of bees and flies sipping from the flowers. I don't know what kind of fly this is. Supposedly the very young shoots are edible, but I haven't caught any at the right stage to try them. 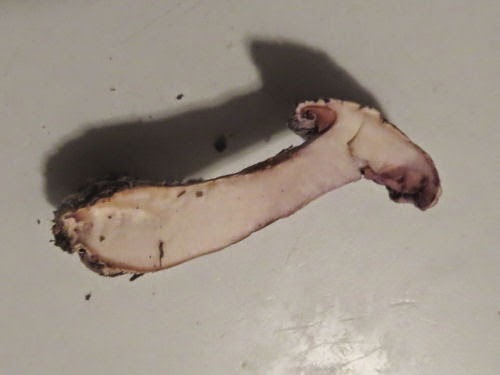 Not feeling very imaginative, and anyway, you already knew that I'd want to dissect this and figure out what it is. You can see that it is a blue/purple mushroom. You'd think that would be quite distinctive, but it turns out there are several choices. 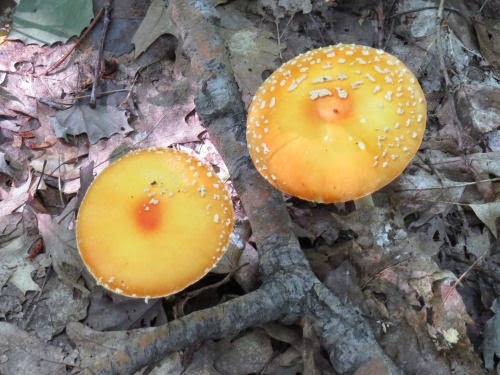 I'm no mushroom expert by a long shot, and it always seems to me that mushrooms are much harder than plants. They seem to change form at every stage of the game, with many more variations and exceptions to the "norm." I think I've got those ones down pat, and they are both toothed, so they are completely eliminated for this one which is gilled. This one has a fat stalk, which pretty much eliminates a couple of others. It's not sticky which is a characteristic of a different one. 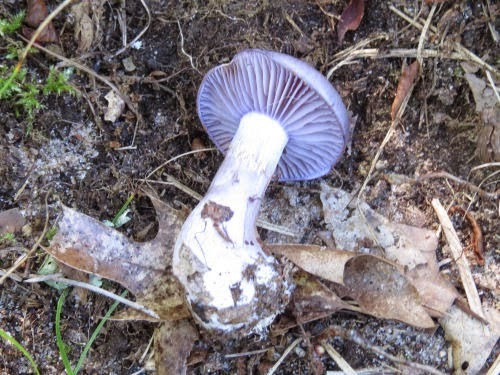 This has purple gills which the Blewit has, but it's supposed to also have a purple stem; this one is white. 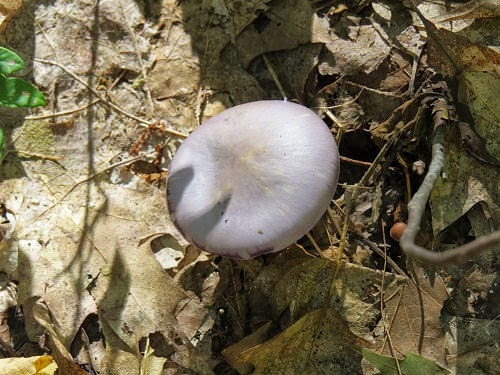 It does not have a central dimple on the cap, but it does have streaks of yellowish-brown, so that says Blewit. I brought a small one home, and forgot to cut it in half right away, so it had dried somewhat. But this gives me two more pieces of information. First, the stem is solid rather than hollow. It also shows how the gills are attached to the stem. The ones on the bottom in the picture broke when I cut it, but you can see how the ones on the top seem to sweep down into the stem. That is also correct for the Blewit. So, I'm going with Clitocybe nuda, the Blewit. The name is some old world language iteration of "blue cap." It's supposed to be highly sought after as a food. I think I'd want an expert opinion of my ID before I tried them! 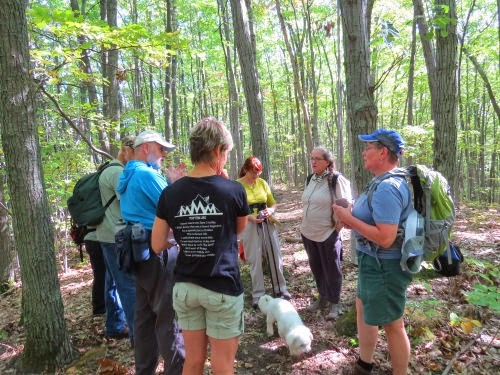 Today was our monthly hike, and it was our event for North Country National Scenic Trail Day. 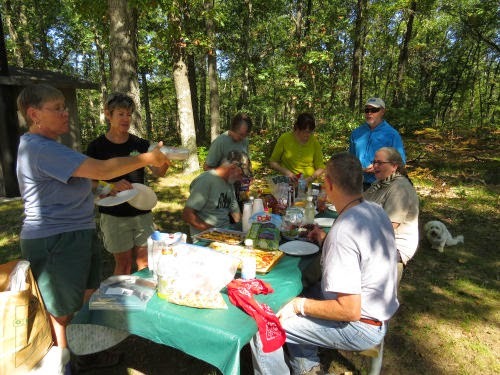 Twelve of us got together for a hike and a picnic. Don't know how far we walked- we just went outbound till we'd had half enough and then turned around. 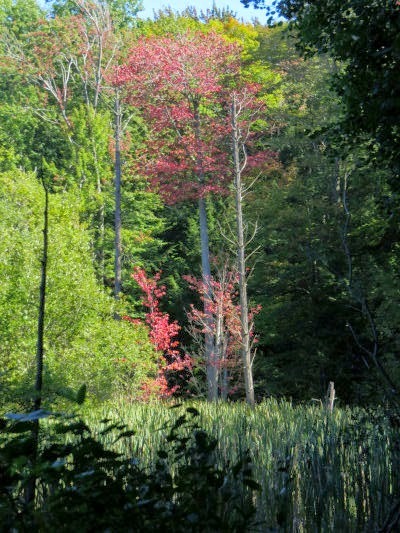 The hike was on the North Country Trail. Somehow, food magically appeared from everywhere (it was a potluck), and we ate wonderful things like veggie pizza, fresh fruit, little hors d'oeuvre, ham sandwiches, homemade tomato/basil/garlic salsa stuff with toast squares, and chocolate. Most of the oohs and aahs of the day were over small mushroom/fungus finds. I like to identify them, but I know rainfield will tell us their magical stories. This is white coral jelly, Tremella reticulata, I'm pretty sure. 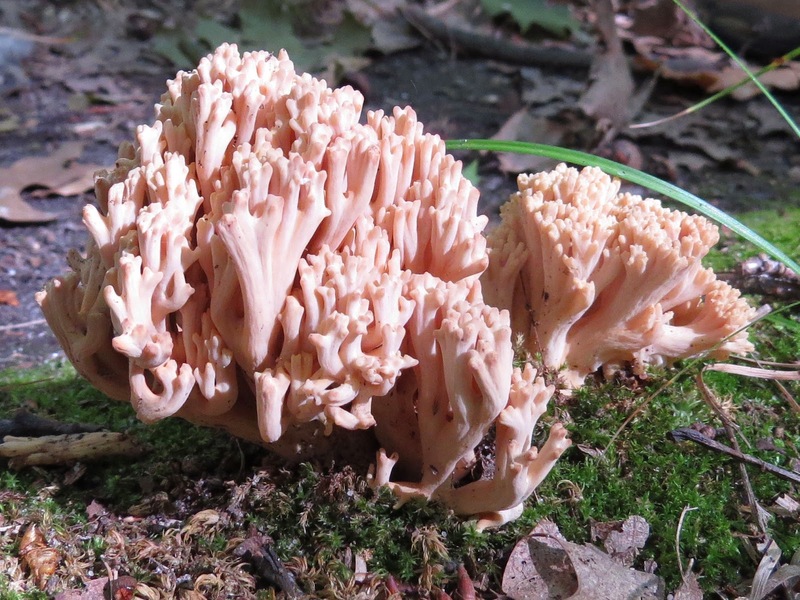 Although it looks more like crowned clavaria, it's really related to the witches' butter. I think those very blunt tips of the "fingers" are the key to the ID. We also saw some purple mushrooms, that will remain a mystery for now. Maybe another day! 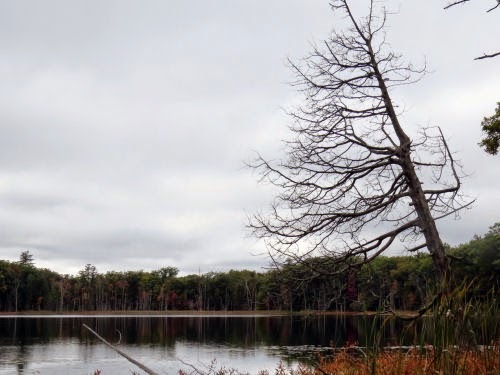 While I was visiting with Ester this weekend, she took me to see some local places of interest. This is the school building in the (very) small village of Leonidas. 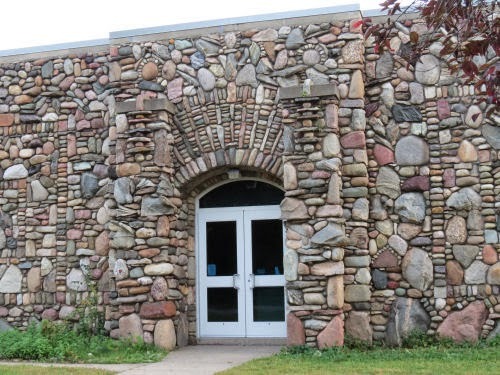 I think this is the most impressive fieldstone building I've ever seen. 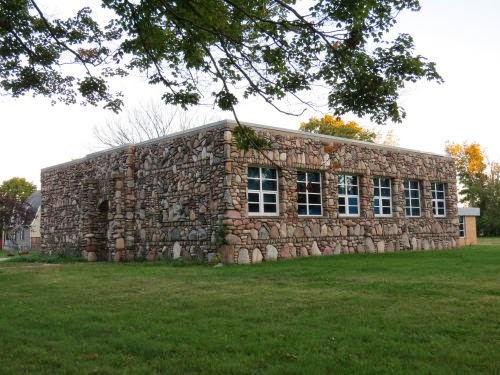 Michigan fieldstone is generally rounded rocks of various sizes which are all compliments of the last ice age. The rocks aren't all of one type. These were all dragged here from elsewhere by the glaciers and then left behind when the ice melted. 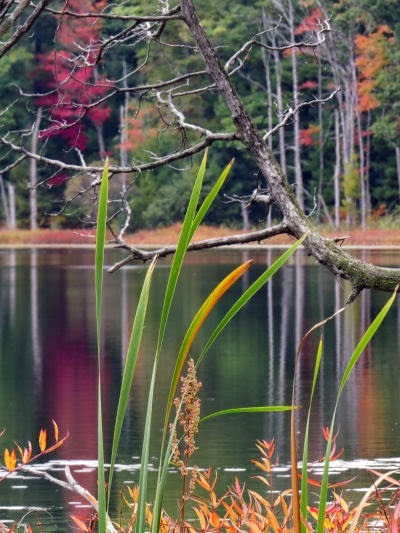 Although the soil is not as full of them as many places in New England, there are still plenty to choose from. 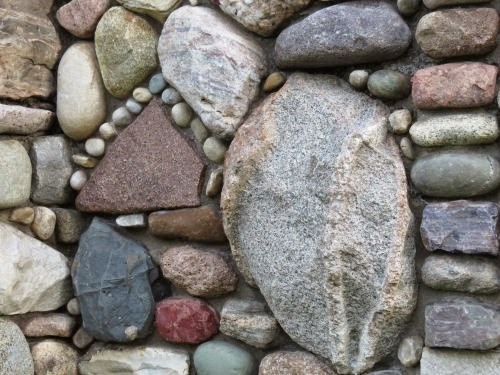 And Michigan doesn't have bedrock from which to cut squared stones. So, people are always going to build things from the materials at hand. And some people can turn it into an art form. 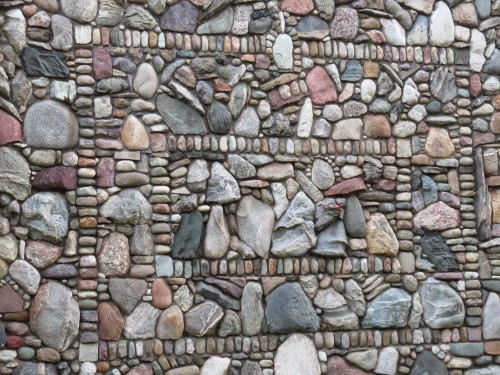 Think of the number of rocks that had to be collected, sorted into sizes and shapes, and then arranged into the patterns evident on this building. I think attending school in a place like this would be inspiring! 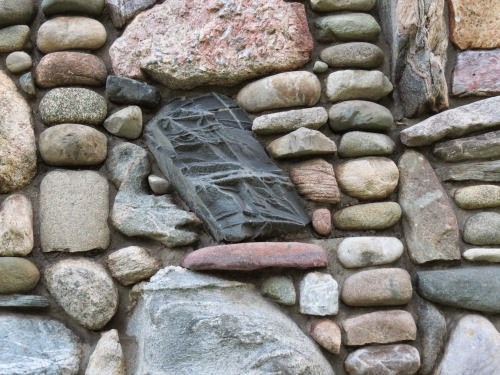 I've previously shown you only one other Michigan fieldstone house (see link below), but I think I'll make it a point to take pictures of more. 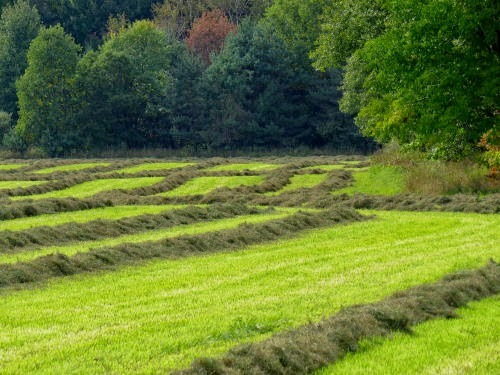 There have been quite a few farmers taking in a last cutting of hay. I snapped the first picture last week. 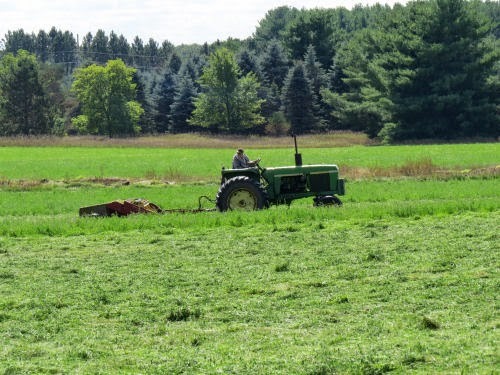 There are several different kinds of machines available to cut the hay and form the windrows. I always find the neat windrows attractive, but I actually turned around and went back this afternoon to take these pictures. The late afternoon sun sure made the colors vivid! I'm really enjoying the clear, cool weather. 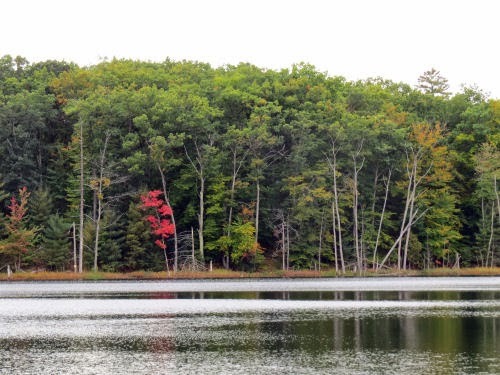 It's not really seriously fall-like yet, and the trees are not turning colors en masse. Yet, there are teases and promises. Today I worked my way home from visiting Ester. It wasn't where I had planned to go for the weekend, but after a phone call, it was the important thing to do. We did see some fun places as well as accomplish some of her goals, and I will write about those places for my newspaper column. Then I was able to do some of my work cases on the trip back. 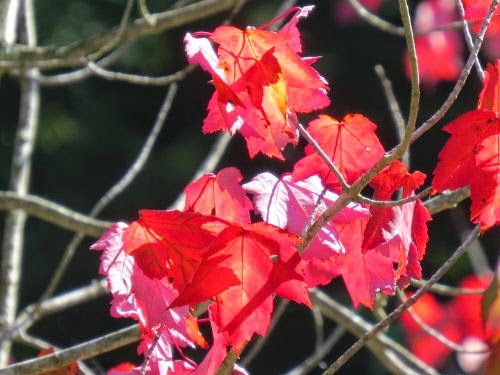 Some of the time, I think I like the pure and bright solid colors of leaves best. Then, I see variegated ones, and I'm sure those must be my favorites. 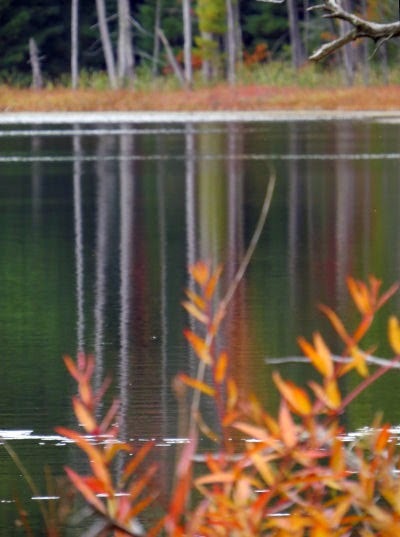 I hope to be seeing quite a bit more of Ester this fall. We have plans! 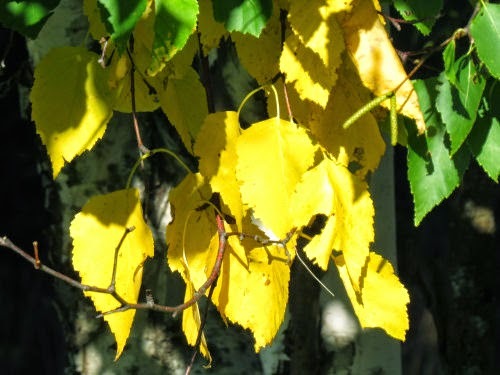 The white aspen, Populus alba, is alien, but it's very pretty, and not very invasive here, although it can be a problem some places. 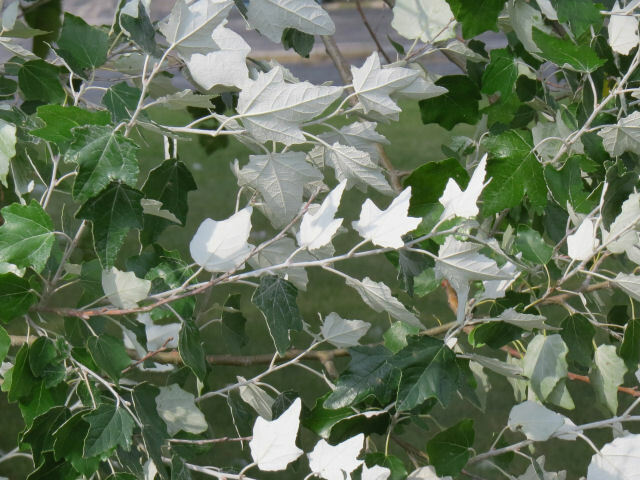 Yesterday, the wind was turning the leaves over to reveal the bright white undersides. This isn't the tree in my kingdom, but still pretty close to me. And I have a really interesting picture of its bark somewhere, but of course, can't find it to put here where it would fit. I suppose you'll just see this tree another time! Commas vs Question Marks... not a punctuation error most people make after first or second grade, right? However, when it comes to butterflies, there is one spot of a difference. Literally. 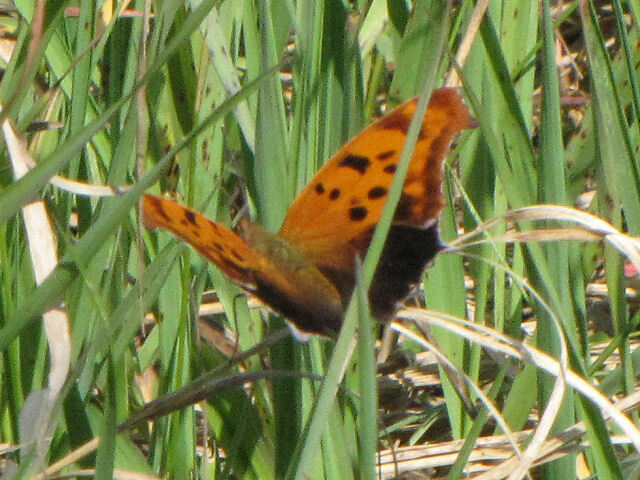 Here's an Eastern Comma, picture taken today. The comma is easy to spot. That's not a flaw in the photo, but a silvery curved line on the underside of the wing. Here's the Comma, Polygonia comma, from the top. 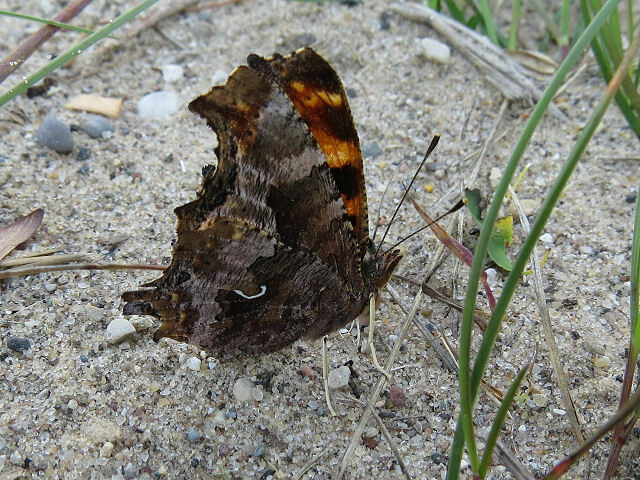 And the Question Mark, Polygonia interrogationis, from the top. See the difference? Don't feel bad... it's not obvious until you know what to look for. 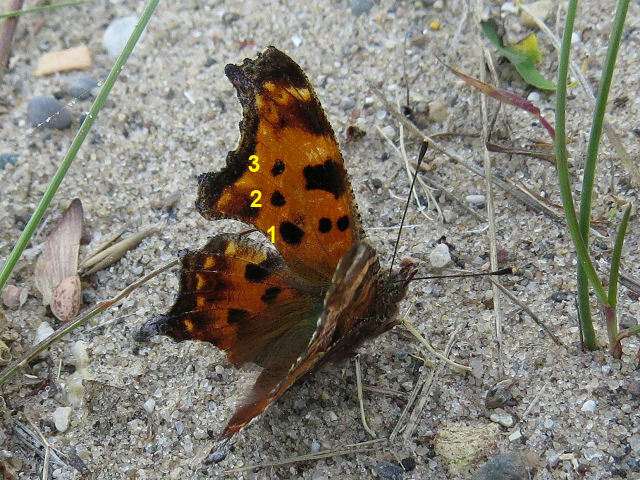 The Comma has three "subapical" spots, and the Question Mark has four. Now you know. Supposedly there is a silvery dot on the underwing in addition to the curved line so that really looks like a question mark too, but I haven't yet gotten a picture of the underside of a Question Mark. 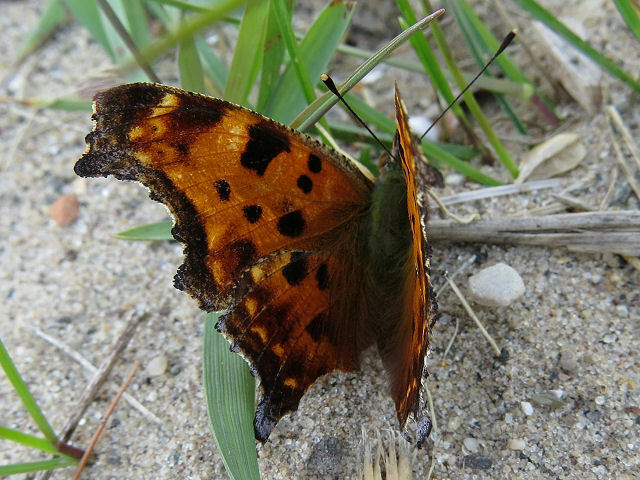 The comma today was sitting very still in the sand and let me take all kinds of pictures. I only wish it would have opened its wings wide, but still I think the pictures are pretty good. I think the funniest thing is its white legs! Would It Be Easier to be Green?